stake. Yet the practice has no room for mistakes or negligence. To that effect, a period of supervised training known as ‘internship’ or ‘housemanship’, where the new young doctors undergo a structured training to enable them consolidate and extend theoretical clinical knowledge and technical skills, is provided for. It is akin to testing soldiers in series of battles after a military drill. A house officer, also known as a houseman, is a term used to refer to the junior doctor who has just joined the noble career. In other countries they are known as a foundation doctors. These are graduates of the college of medicine, holders of MBBS (Bachelor Medicine and Bachelor of Surgery) but still lacking the field experience, and are not yet licensed by the medical councils of their countries. Housemanship is the culmination of undergraduate medical education and the beginning of medical career. It is a certain period of training during which a house officer undergoes intensive, comprehensive supervised training. The noble aim of internship training is to provide the young doctors with an educationally sound experience that professionalizes new medical graduates not only with appropriate knowledge, skills and experience but above all attitudes. In certain countries, undergraduate medical education ends with internship as part of the college of medicine program. 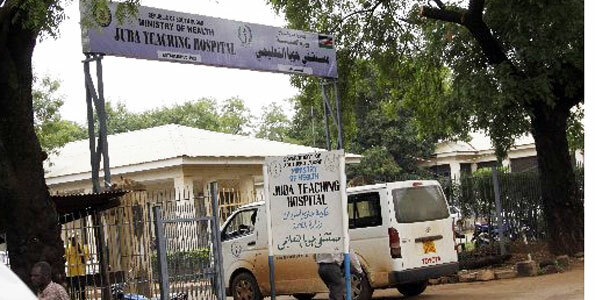 However, in South Sudan, pursuant to the Medical Act, internship is only imposed upon after graduation. The period of internship combines service and training roles. It is formulated in such a way to ensure medical practitioners gain appropriate knowledge, skills and experience as well as correct attitude rather than merely employment and provision of services. The House Officer is a rare breed of doctors whom the patient meets the most when entering to the hospital and will remember the most after they, hopefully, leave the hospital. He/she is the good face of the hospital, the source of patient’s joy, and the caregivers’ comfort when their beloved ones were intervened and saved. The house officer is the primary doctor that responds and attends to all the emergencies at the hospital outpatient department as well as following the minutes/conditions of patients admitted to the wards. He makes the necessary calls to other senior staff. These junior doctors play a vital role in the hospital. In the truest sense of the word, they are the typical housewives of the hospital. 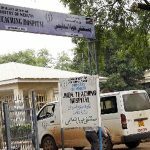 The extraordinary commitment, efforts and the stout role of the house officers at Juba Teaching Hospital have not received any attention from authorities. Their challenges are neither considered nor covered by the media. Out of several complaints and appeals to the Ministry of Health from the junior doctors in the past years, only a few were unconvincingly replied to, several were denied and on several occasions house officers are referred to as young students lacking patience and eager of progress. A critical example was the April 2016 showdown between then house officers and the Ministry which resulted in a strike. It was through the President’s intervention that these doctors were paid salaries for ten months at once and were able to continue with their duties. This was the last money ever to be received by a house officer up to this time of writing. Today the Ministry of Health enjoys good reputation for healthcare because of a bunch of hardworking countrymen who toil, roll and spin without salt or pay. Stress in the medical profession is inevitable. The reality of having to deal with another person’s life as a doctor can be scary. Newly graduated doctors are expected to be directly responsible for patients under their care. This is in stark contrast to years spent in the medical school where they were not responsible for the management of patient’s health, except for fantastic talks on the pathophysiology of disease and clinical maneuvers during ward rounds with their tutors. Aside from the fact that our working environment is likely contaminated with unlimited deficiencies ranging from poor administrative system extending to unhygienic workplace, insufficiency of permanent staff has left these young clinicians to depend on part-time staff and visiting consultants. All young doctors and medical students owe sincere gratitude and respect to these noble countrymen and countrywomen. Stress among these young striving doctors is attributed to several factors both in the workplace – for instance, the heavy work load, conceited patients, and an aggressive supervision in the hospital – and from outside. It is mainly induced by the long-awaited expectations of the family and relatives, and darlings being brought to naught by prevailing circumstances. This cruel socio-economic situation in the country has only aggravated the matter. This stress can affect performance and decision making, to a great extent, while addressing the needs of patients especially during emergencies. This article is written particularly to discuss matters of house officers exploring in details the challenges, stress imposed on them as well as their heroic commitment and dedication to the beloved and noble profession of Medicine. 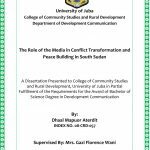 The author is a house officer (intern doctor) at Juba Teaching Hospital. He can be reached at joboya424@gmail.com.